Handbrake (0.9.2/1.0.0) is a free yet open-source software application that is capable to rip DVD (VIDEO_TS or Video Object) into a MPEG-4 video file in .mp4, .avi, or .mkv containers. It merely needs five simple clicks to accomplish the whole ripping procedure. Hence, Handbrake is highly acclaimed by numerous users, among which many a user has the demand to rip DVD to AVI for playback DVD movies on their Xbox One, PSP, PS4, ZEN and more portable devices rather than solely enjoy DVD on DVD players or computers. If you wonder how to use Handbrake 0.9.2 to rip DVD to AVI on Mac, the following elaborating tutorial will illustrate you how to rip DVD to AVI with Handbrake 0.9.2 without any hassle. May success find its way to you. •	The source file is in an unsupported format. The list of supported source formats for Handbrake including: 3GP, AVI, FLV, MKV, MOD, MOV, MP4, MPG, WMV, MKV, AVI, etc. videos. If your video can't be recognized by Handbrake or VLC, you can turn to other Handbrake alternative which supports a tons of input & output video formats covering all most popular video encoding and decoding like M2TS to MP4, MKV to AVI, WMV to MOV, FLV to AVI, MKV to MP4, etc. •	Your copy of Handbrake is corrupt. A fresh download and reinstall of the app is the solution for this problem. •	The source DVD is copy protected. Handbrake official site claims that the later version above 0.9.4 has ripping function to circumvent copy protected DVD, but the feedbacks and topics searched on forums/answering site reveal that Handbrake does not crack the latest DVD copy protection schemes hatched by the studios. That's why you commonly encounter the issue that Handbrake does the scan through the chapters fine but there is no Chapter selected to transfer, or you directly get the "No Title(s) error." in Handbrake. Take advantages of Handbrake alternative to rip copy protected DVDs to AVI, MP4, MOV, WMV, etc on Mac and Win. Play any DVD movies on iPhone iPad Android easily. Step 1: Free download Handbrake 0.9.2 and launch Handbrake Mac. Step 2: On the "Source" field, click "Browse" button and opt for DVD resource you want to rip to AVI file format from a new window popped. Step 3: On "Destination" portion, select the output path where you want to save your new AVI file by clicking the "Browse" button. Step 4: Move your mouse to the "Output Settings" field, and choose Xvid as the output video encoder from the "Encoder". Step 5: Now simply click "Start" button at the very top of the main Handbrake window to rip DVD to AVI format. After all the above steps, just quietly wait and let Handbrake DVD decoder do the rest for you. 1. The above tutorial comes into effect only with Handbrake 0.9.2. Providing you intend to use Handbrake 0.9.3 or apply Handbrake 1.0.0 to rip DVD to AVI, fat chance. You are about to have a meltdown, since Handbrake 0.9.3 and later version all discarded the AVI container and codec. Even if you have an option to rip DVD to AVI with MPEG-4 encoder, the output video quality may be not as satisfying as AVI container with Xvid codec. 2. Although Handbrake is a terrific yet gratis software that can rip and convert DVD to MP4, NKV and other common file formats, it contains an Achilles' heel: impotent to rip any encrypted protection DVD on its own, even the common region code 1-6, RCE, CSS, UoPs, Sony ARccOS, let alone the latest Disney X-project protection . It can't work with copy-protected DVD unless it receives assistance from third-party software and libraries. Tips: Still feel confused about how to download Handbrake to rip DVD, please refer to Handbrake DVD rip Tutorial. For those who wanna rip new DVD movies like Frozen, Monsters University and Inside Out and Powerful to AVI on Mac for playback on Xbox One, PSP, etc., and are tired to waste time to download third-party software for Handbrake, here recommends you a Handbrake alternative- MacX DVD Ripper Pro as the first-ranking yet comprehensive DVD ripper to worry-free rip any encrypted DVD to AVI in a flash. Aside from as Handbrake alternative to rip encrypted DVD to AVI on Mac, this DVD ripper for Mac can also deliver various eye-popping features that it can let Mac users rip DVD to MP4, DVD to MOV, FLV, H.264, MKV, to name just a few, but also empower users to directly rip DVD to specific devices, like DVD to Xbox One, PSP, iPhone XS/XR/X/8/7/6s/6/6 Plus/5S/C, DVD to iPad mini (Retina)/Air and more with scores of preset profiles provided. More remarkably, it's hard to ignore its powerful DVD decrypting ability that it can easily parry DVD copy protections, no matter region code 1-6, RCE, CSS, Sony ARccOS, or the latest Disney X-project protection. They are totally a piece of cake to it. For your reference: To play the converted DVD contents on iPhone iPad iPod, you are suggested to use MacX MediaTrans to transfer video from computer to iDevices. And this iOS data transfer also can aid you to transfer music from iPhone to Mac or vice versa, transfer photos from iPhone to Mac, create personal ringtones, copy eBooks and more. 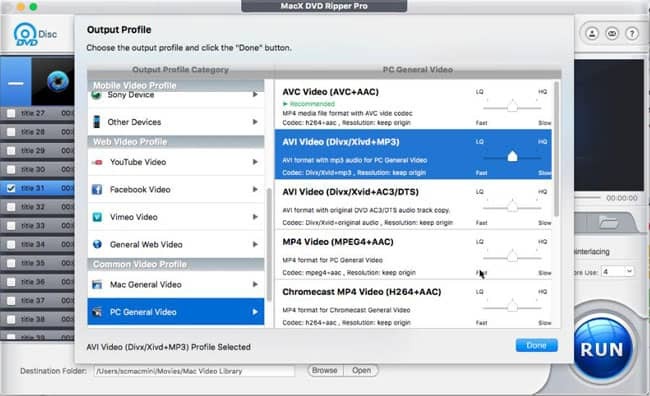 MacX DVD Ripper Pro, topmost alternative to Handbrake can easily rip encrypted DVDs to AVI, MP4, MOV, WMV, MKV, etc on Mac/Win for compatible with iPhone iPad Android devices. Original quality reserved and 36X faster speed.